PrologBeans is a package for integrating Prolog with applications written in other languages. Currently Java and .NET are supported. PrologBeans is based on running Prolog as a separate server process, and the other part of the application as a client process. This makes PrologBeans automatically distributable since the server and the client can run on different computers anywhere on the Internet. PrologBeans is designed to be used when client applications need to send queries to a Prolog server (and less intended for showing a GUI from a Prolog program). One typical application would be to connect a Java or .NET based web application to a Prolog server (see examples later). 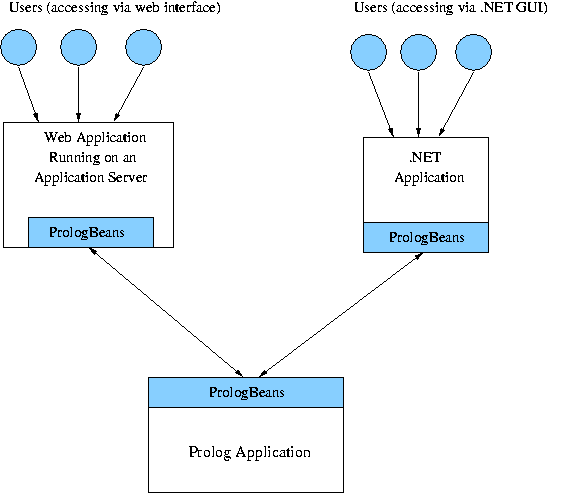 PrologBeans setup where the Prolog application serves several users accessing both via a web application server and a .NET GUI. The PrologBeans package consists of two parts. The Prolog server is a library module, library(prologbeans). The client is a class library, prologbeans.jar for Java (installed on all platforms), and prologbeans.dll for .NET (only installed on Microsoft Windows platforms).